This season, CBS cut the “Mystery” from 48 Hours Mystery. Under either title, it’d be hard to imagine Saturday nights without this venerable TV series. How low would the ratings have to go for it to be cancelled? Last season, the numbers declined. Will they keep going? Stay tuned. 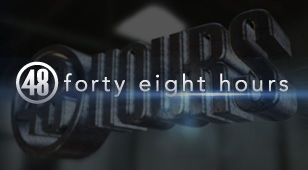 48 Hours typically airs on Saturday nights on CBS. Correspondents include Richard Schlesinger, Erin Moriarty, Susan Spencer, Peter Van Sant, Troy Roberts, and Maureen Maher. Below are the TV show’s ratings for the 2012-13 season, the best way to tell if 48 Hours will be renewed for a 26th year. Final season averages: 1.0 rating in the 18-49 demographic with 5.31 million total viewers. 0.8 in the demo (-20% change) with 3.92 million (-32% change). Season averages: 1.02 in the demo with 5.31 million. 1.0 in the demo (0% change) with 5.78 million (+3% change). Season averages: 1.03 in the demo with 5.38 million. 1.0 demo rating (+11% change) with 5.64 million (+16% change). Season averages: 1.03 in the demo with 5.34 million. 0.9 in the demo (-10% change) with 4.88 million (-10% change). Season averages: 1.03 in the demo with 5.33 million. 1.0 in the demo (-17% change) with 5.44 million (-14% change). 1.2 in the demo (+33% change) with 6.33 million (+26% change). Season averages: 1.04 in the demo with 5.34 million. UPDATE: 48 Hours has been renewed for a 26th season by CBS. 0.9 in the demo (0% change) with 5.04 million (-8% change). Season averages: 1.03 in the demo with 5.30 million. 0.9 in the demo (-10% change) with 5.48 million (-7% change). Season averages: 1.03 in the demo with 5.31 million. 1.0 in the demo (0% change) with 5.88 million (+14% change). Season averages: 1.04 in the demo with 5.30 million. 1.0 in the demo (+11% change) with 5.15 million (-11% change). Season averages: 1.04 in the demo with 5.28 million. 0.9 in the demo (-25% change) with 5.81 million (-7% change). 1.2 in the demo (+50% change) with 6.26 million (+28% change). Season averages: 1.05 in the demo with 5.25 million. 0.8 in the demo (-20% change) with 4.89 million (-7% change). Season averages: 1.04 in the demo with 5.20 million. 1.0 in the demo (-9% change) with 5.28 million (-4% change). Season averages: 1.06 in the demo with 5.22 million. 1.1 in the demo (-15% change) with 5.49 million (-4% change). Season averages: 1.06 in the demo with 5.21 million. 1.3 in the demo (+18% change) with 5.72 million (-3% change). Season averages: 1.06 in the demo with 5.19 million. 1.1 in the demo (+10% change) with 5.92 million (+21% change). Season averages: 1.04 in the demo with 5.16 million. 1.0 in the demo (+25% change) with 4.90 million (+12% change). Season averages: 1.04 in the demo with 5.10 million. 0.8 in the demo (-47% change) with 4.38 million (-32% change). Season averages: 1.04 in the demo with 5.11 million. 1.5 in the demo (+25% change) with 6.40 million (+18% change). Season averages: 1.06 in the demo with 5.18 million. 1.2 in the demo (0% change) with 5.44 million (-10% change). Season averages: 1.02 in the demo with 5.06 million. 1.2 in the demo (+71% change) with 6.05 million (+41% change). Season averages: 1.00 in the demo with 5.02 million. 0.7 in the demo (-36% change) with 4.30 million (-21% change). Season averages: 0.97 in the demo with 4.89 million. 1.1 demo rating (-8% change) with 5.41 million (-10% change). Season averages: 1.01 in the demo with 4.97 million. 1.2 demo rating (+20% change) with 6.02 million (+19% change). Season averages: 1.00 in the demo with 4.90 million. 1.0 demo rating (0% change) with 5.08 million (-7% change). Season averages: 0.96 in the demo with 4.67 million. 1.0 demo rating (0% change) with 5.48 million (+12% change). Season averages: 0.95 in the demo with 4.57 million. 1.0 demo rating (+11% change) with 4.88 million (+58% change). Season averages: 0.93 in the demo with 4.27 million. 0.9 demo rating (0% change) with 3.09 million (-36% change). Season averages: 0.90 in the demo with 3.97 million. 0.9 rating in the 18-49 demographic with 4.84 million total viewers. Season averages: 0.9 in the demo with 4.84 million. Year-to-year, 48 Hours was down by 25% in the demo (vs a 1.2 rating) and down by 2% in viewership (vs 4.93 million). Reference point: The 2011-12 season averaged a 1.2 rating in the 18-49 demographic and 5.39 million viewers. Note: These ratings are collected and copyrighted by the Nielsen company. What do you think? Do you like the 48 Hours TV series? Do you think it should be cancelled or renewed for a 26th season? I’m with M.Brewster. We’re thinking of only watching Cable networks. They play the episodes in the correct sequence without preempting them over the months. If they keep cancelling shows like 48 Hours (Mystery). What the heck are we supposed to watch?